Our team was honored to work with so many talented vendors in order to create this dramatic tale of forbidden romance at the California Wedding Day "Best Of" 2014 Awards. We hope you fall in love like we did! 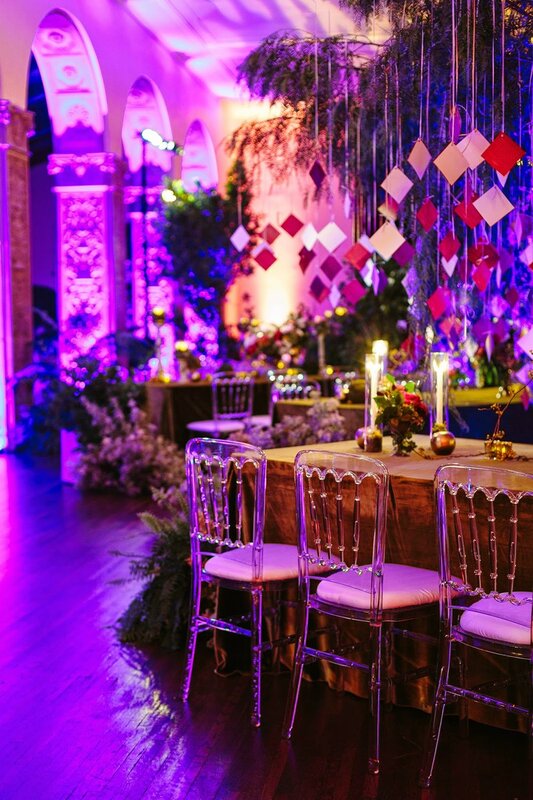 Dimly lit and beautifully designed, this room took our breath away! Guests were surrounded by lush, live greenery as their eyes feasted on the Eden-esque tablescapes. Amidst our gorgeous, dramatic floral pieces were golden apples and forbidden fruit. Gold mercury votives mixed with different types of moss sat at the bases of our aged and ivy-wrapped candles. Dominating the center of the room was a tree seemingly fresh out of Eden. Visually breathtaking, the tree featured hundreds of various romantic quotes intertwined with extra forbidden fruit. Sashaying underneath the tree and throughout the room were our beautiful models. They donned custom-made floral jewelry and truly made our "Forbidden Romance" come to life!